Our egomaniacal narcissist Twitter-troll-in-chief offered condolences on Twitter to Sen. John McCain’s family, but this small and petty man rejected plans for a White House statement praising McCain: President Trump nixed issuing a statement that praised the heroism and life of Sen. John McCain, telling senior aides he preferred to issue a tweet before posting one Saturday night that did not include any kind words for the late Arizona Republican. U.S. flags at the White House returned to full staff on Monday morning as the nation continued to mourn the death of Sen. John McCain (R-Ariz.). Flags at White House return to full staff after brief tribute to McCain. The malignant cancer of “Trumpism” is self-evident in the GOP primary here in Arizona. In most of the country, McCain is being lauded as a hero. On Arizona’s GOP campaign trail, he’s a pariah. The Arizona Republican Party that nurtured McCain and his retiring Senate colleague Jeff Flake, whose seat those candidates are seeking, has been overrun by the party of Donald Trump. For Republican candidates now, the imperative is to embrace the president lest they lose his voters — and many of those voters share Trump’s antipathy to McCain. Some analysts expect McCain’s death will only hasten the state’s political transformation. [T]here will be another opportunity to demonstrate the GOP shift. Arizona Gov. Doug Ducey will appoint a replacement to fill McCain’s seat until 2020, when a special election will determine the occupant until 2022, when McCain’s term would have ended. Gov. Ducey’s choice carries enormous implications in Washington. The governor’s appointee will represent the state through most of 2020, when there will be a special election to fill the rest of Mr. McCain’s term, and Republicans close to Mr. Ducey indicated he is likely to pick a replacement who intends to run again rather than a caretaker to temporarily fill the seat. ABSOLUTELY NOT! Governor Ducey should appoint a caretaker who will promise not run in 2020, to allow Arizona’s voters to decide for themselves from among an array of candidates who will run to fill an open seat in 2020. Anyone appointed as caretaker to Senator McCain’s seat should exhibit the same “maverick” independence from party orthodoxy as did Sen. McCain. 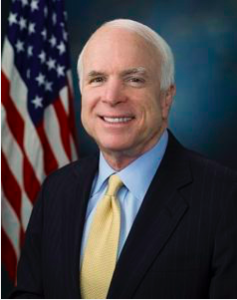 The obvious choice for a caretaker in Sen. McCain’s “maverick” mold is his widow, Cindy McCain. Arizona’s primaries are Tuesday, and the race to replace Mr. Flake there has evolved into a contest over who can claim the mantle of the president — not that of the iconic war hero [John McCain] who frequently defied his own party over 35 years in Congress. But Arizona Republicans familiar with the governor’s thinking suggest he would like to appoint an individual who, in addition to running again in 2020, would be acceptable both to the conservative grass-roots of the party he will need in November, and to Mr. McCain’s friends and family. The McCains did not offer any guidance, let alone make suggestions about a successor, to Mr. Ducey in the days leading up to the senator’s death. Arizona Republicans are skeptical Mr. Ducey would pick Mr. McCain’s widow, in part because of questions about whether she would want to seek the nomination in 2020 — precisely why she should be appointed caretaker — but also because it could anger the pro-Trump voters that the governor will need to win in November. To those voters, Ms. McCain would almost certainly be viewed as too politically moderate. In other words, an ideologue who will vote the GOP party-line as the Turtle Man determines. Not going to happen. I would ask Governor Ducey to do the right thing and appoint a caretaker, but when has he ever done the right thing? Arizona appears destined for mediocrity and a true believer in the personality cult of Trump for the next two years. We will know next Monday.